Fraud detection is one of the top priorities for banks and financial institutions, which can be addressed using machine learning. According to a report published by Nilson, in 2017 the worldwide losses in card fraud related cases reached 22.8 billion dollars. The problem is forecasted to get worse in the following years, by 2021, the card fraud bill is expected to be 32.96 billion dollars. 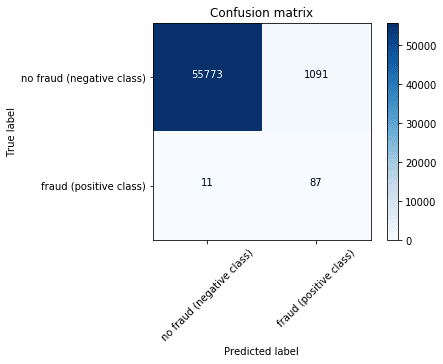 In this tutorial, we will use the credit card fraud detection dataset from Kaggle, to identify fraud cases. We will use a gradient boosted tree as a machine learning algorithm. And finally, we will create a simple API to operationalize (o16n) the model. We will use the gradient boosting library LightGBM, which has recently became one of the most popular libraries for top participants in Kaggle competitions. Fraud detection problems are known for being extremely imbalanced. Boosting is one technique that usually works well with these kind of datasets. It iteratively creates weak classifiers (decision trees) weighting the instances to increase the performance. In the first subset, a weak classifier is trained and tested on all the training data, those instances that have bad performance are weighted to appear more in the next data subset. Finally, all the classifiers are ensembled with a weighted average of their estimates. In LightGBM, there is a parameter called is_unbalanced that automatically helps you to control this issue. LigtGBM can be used with or without GPU. For small datasets, like the one we are using here, it is faster to use CPU, due to IO overhead. However, I wanted to showcase the GPU alternative, which is trickier to install, in case anyone wants to experiment with bigger datasets. (fraud)$ python -m ipykernel install --user --name fraud --display-name "Python (fraud)"
The first step is to load the dataset and analyze it. For it, before continuing, you have to run the notebook data_prep.ipynb, which will generate the SQLite database. As we can see, the dataset is extremely imbalanced. The minority class counts for around 0.002% of the examples. The next step is to split the dataset into train and test. For this task we use a simple set of parameters to train the model. We just want to create a baseline model, so we are not performing here cross validation or parameter tunning. The details of the different parameters of LightGBM can be found in the documentation. Also, the authors provide some advices on how to tune the parameters and prevent overfitting. Once we have the trained model, we can obtain some metrics. In business terms, if the system classifies a fair transaction as fraud (false positive), the bank will investigate the issue probably using human intervention. According to a 2015 report from Javelin Strategy, 15% of all cardholders have had at least one transaction incorrectly declined in the previous year, representing an annual decline amount of almost $118 billion. Nearly 4 in 10 declined cardholders report that they abandoned their card after being falsely declined. However, if a fraudulent transaction is not detected, effectively meaning that the classifier predicts that a transaction is fair when it is really fraudulent (false negative), then the bank is losing money and the bad guy is getting away with it. A common way to use business rules in these predictions is to control the threshold or operation point of the prediction. This can be controlled changing the threshold value in binarize_prediction(y_prob, threshold=0.5). It is common to do a loop from 0.1 to 0.9 and evaluate the different business outcomes. The next step is to operationalize (o16n) the machine learning model. For it, we are going to use Flask to create a RESTfull API. The input of the API is going to be a transaction (defined by its features), and the output, the model prediction. Aditionally, we designed a websocket service to visualize fraudulent transactions on a map. The system works in real time using the library flask-socketio. To start the api execute (fraud)$ python api.py inside the conda environment. # You can also run the api from inside the notebook (even though I find it more difficult for debugging). Now, we are going to select one value and predict the output. Now that we know that the main end point of the API works, we will try the /predict_map end point. It creates a real time visualization system for fraudulent transactions using websockets. A websocket is a protocol intended for real-time communications developed for the HTML5 specification. It creates a persistent, low latency connection that can support transactions initiated by either the client or server. In this post you can find a detailed explanation of websockets and other related technologies. Once we have the API, we can test its scalability and response time. Here you can find a simple load test to evaluate the performance of your API. Please bear in mind that, in this case, there is no request overhead due to the different locations of client and server, since the client and server are the same computer. The response time of 10 requests is around 300ms, so one request would be 30ms. In this tutorial we have seen how to create a baseline fraud detection model. However, for a big company this is not enough. In the next figure we can see a reference architecture for fraud detection, that should be adapted to the customer specifics. All services are based on Azure. 1) Two general data sources for the customer: real time data and static information. 2) A general database piece to store the data. Since it is a reference architecture, and without more data, I put several options together (SQL Database, CosmosDB, SQL Data Warehouse, etc) on cloud or on premise. 3) Model experimentation using Azure ML, again, using general computation targets such as DSVM, BatchAI, Databricks or HDInsight. 4) Model retraining using new data and a model obtained from the Model Management. 5) Operationalization layer with a Kubernetes cluster, which takes the best model and put it in production. 6) Reporting layer to show the results.